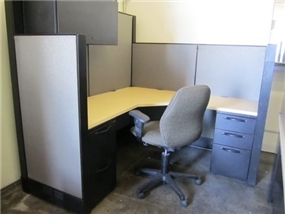 Used Herman Miller Q Cubicles in 5.5 x 5.5 size. These used Herman Miller workstations feature a BBF (2 drawers, file) and FF (2 files) for storage. Our used Herman Miller Q cubicles also come with an overhead storage bin. The used Herman Miller workstations are rated 4 of 5 and are located in Los Angeles. Price does not include delivery, assembly or installation. Contact MFC for delivery options and prices. Currently we only deliver to California. Customer can arrange their own out of state shipping.